New York home of the Statue of Liberty, Coney Island and world famous pizza is not only a great tourist attraction, but also home of the third oldest U.S. lottery, the New York Lottery following Puerto Rico (2nd oldest) and New Hampshire (oldest). The first New York Lottery drawing was held in 1967 to help raise funds for educational purposes. Today, the New York Lottery is one of the country’s top lotteries besides, Powerball, Hot Lotto and Mega Millions although New York offers Mega Million and Powerball tickets to residents for purchase. Prior to the 20th century, lotteries were used in New York to raise revenue for non-educational needs. New York City Hall was built in part with lottery proceeds. Other lotteries helped build and repair canals, roads, ferries, and bridges. Lotteries also were held for non-public needs. They helped develop New York City’s manufacturing industries. Churches were built, rebuilt, or improved, with lottery funds. On February 1, 2013, the New York Lottery’s operations were merged with that of the New York State Racing and Wagering Board to form the New York State Gaming Commission. New York joined Powerball (now played in 44 jurisdictions) in 2010, after a cross-sell agreement allowed the game to be sold alongside Mega Millions. Powerball is the US drawing game with the highest prize potential. Each game is $2; with Power Play, $3. The minimum jackpot is $40,000,000. Players choose 5 numbers from a field of 59, and a Powerball from 1 to 35. Drawings are Wednesdays and Saturdays. ld-colored Mega Ball, a number from 1 through 46. Mega Millions costs $1 per game; with Megaplier, $2. The Mega Millions minimum jackpot is $12,000,000. New York joined what had been The Big Game in May 2002, when the name Mega Millions was adopted. The Megaplier (a multiplier of 2, 3, or 4) became available in New York in January 2011; simultaneously, the Lottery discontinued the requirement of choosing cash or annuity when playing Mega Millions. As with most Mega Millions members, New York now gives jackpot winners a 60-day window, upon claiming, to make the choice. Three sets of balls, numbered 0 through 9, are drawn twice daily. Options and prizes vary. Played as Numbers, but with four machines. As with Numbers, the minimum wager is 50 cents, except for combination wagers. io ads, there is an average of about 100,000 winners daily. The Lottery has, for promotional purposes, added a “bonus ball” to Take 5. In these drawings, there are eight prize levels; such drawings allow winning with just one number, plus the bonus ball. vailable wherever Lottery draw games are sold, including Quick Draw retailers. Quick Draw is a keno-style game drawn every 4 minutes from 4:04 a.m. to 3:24 a.m. Players choose 1 to 10 numbers; a computer draws 20 numbers from 1 through 80. Minimum play is $1. Prizes and options vary; the 10-spot game has a top prize of $100,000. 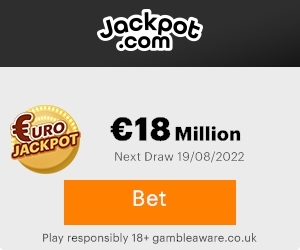 It is played at a limited number of Lottery retailers with a monitor showing the drawings; these establishments generally serve alcoholic beverages. The minimum age for playing Quick Draw is 21 where alcohol is served, while it is 18 elsewhere, including liquor stores. Sweet Million is drawn Monday and Thursday nights. Players choose six numbers for each $1 game. Six numbers are drawn from a pool of 40 numbers for Sweet Million. Matching three numbers wins $3, four numbers, $40, five numbers, $500. Matching all six numbers wins $1,000,000, payable in a lump sum; in the unlikely event there are more than five top-prize winners, they split $5,000,000 (to date, the highest number of tickets winning in a given drawing is two.) The payout percentage in Sweet Million is 49%. As the payout percentage in Lotto is a statuatory 40%, sales of the game have been in a years-long decline, especially since the addition of Mega Millions (in 2002) and Powerball (in 2010) to the Lottery’s portfolio; Powerball is also drawn on the same nights as Lotto, an additional factor. The 2011–12 fiscal year saw Lotto sales decrease by nearly 8 percent, despite overall Lottery sales increasing. The starting Lotto jackpot was reduced from $3 million to $2 million (in 26 graduated payments) in April 2013, rollovers were reduced from $500,000 to $300,000 over Thanksgiving weekend in 2012; in the late 1990s, its jackpot was $10 million after only one rollover. Lottery drawings are syndicated to television stations. Pick 10 drawings air nightly on MSG Network and the Sabres Hockey Network at 11:00 p.m., or during the next commercial break. Other draw games, except for Sweet Million, air on these stations. Mega Millions (drawings held in Atlanta) and Powerball (drawings in Florida) are drawn at 11:00 p.m., while Take 5 and Lotto are drawn at 11:21 p.m. The Numbers and Win 4 drawings are held at 12:30 p.m. and 7:30 p.m. Powerball drawings can be seen in the New York and Rochester areas via the national cable/satellite feed of WGN America. Sweet Million drawings are viewable online only. Its drawings are held Mondays and Thursdays at 9:30 p.m.